Time is a concept as big as the universe and smaller than a New York minute. Time gone by is compressed into chapters of human knowledge called history; the future unfolds, relentlessly, each instant. Time is beyond our control, despite our efforts. We've splintered its meaning into clichés, frozen bits of it in images and corralled it into standardized units, but we cannot alter time's only direction: forward. All of these heady ideas and more swirl through Milton Rosa-Ortiz's current exhibit, aptly titled "An Ode to Time," at the BCA Center in Burlington. The gallery's description suggests that his work challenges "our cultural disinterest and disrespect for aging," and to some extent that is true. But Rosa-Ortiz himself seems more interested in the cosmic aspect of the passage of time. You might even call his work an homage. As BCA curator DJ Hellerman puts it, "Milton conflates big narratives with small narratives — love, life, death and dying. He puts events of the day with things we struggle with for centuries." Rosa-Ortiz's work, Hellerman suggests, is "meditative." Still, to the casual visitor at BCA, the Burlington artist's diverse collection of three-dimensional works may not seem to refer overtly to the inexorable march of time, much less voice an "OMG, I'm getting old" personal lament. The clues are subtler, often loftier and, as befits any sophisticated art, open to interpretation. Far from pedantic, Rosa-Ortiz's work invites scrutiny on its own aesthetic terms. And in it, viewers will find that the weight of history is balanced by often-dazzling beauty and painstaking craftsmanship. "All my OCD-ness goes into my work so I can live relaxedly," the artist jokes, inventing an adverb. Two years ago, an art commission from some friends in Warren brought Rosa-Ortiz to Vermont, and he instantly fell in love. Living in Brooklyn at the time, he says, "I had always wanted to return to the outdoors." This, he felt certain, was the place. With a newly minted bachelor's of science in nursing degree in hand, he pursued and landed a job at the University of Vermont Medical Center and moved to Burlington. Rosa-Ortiz recently purchased a home in the Old North End; as far as he is concerned, he is here for good. "Del agua mansa, libreme Dios"
Like many of us, Rosa-Ortiz has not passed through time on a straight or predictable path. Now 47, he was born in San Juan, Puerto Rico, the second of four children, and raised by a single mother. "I have a long lineage of strong, creative women," he comments. "My generation was the first to go to college. But no one else in the family was artistic." 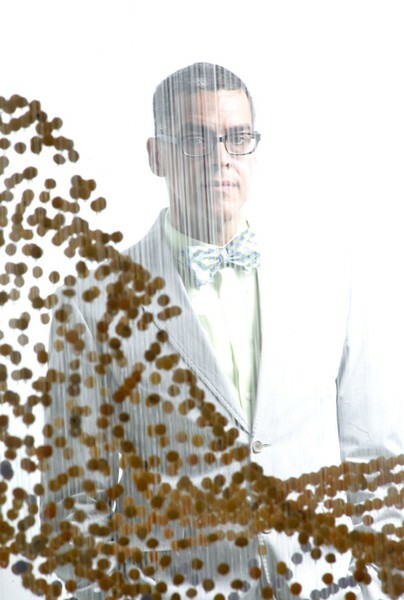 His first career was in architecture; a degree from Kansas State University led to employment with a couple of firms in Aspen, Colo. Five or so years into that work, Rosa-Ortiz started to "make things." He was too modest to call himself an artist. Not yet. One of his first creations came out of a welding class he took at the Anderson Ranch Arts Center in Snowmass Village, Colo. Though he didn't realize it at first, he says, the piece — resembling the wings of a butterfly — addressed the untimely death of his younger brother in a scuba diving accident. It remains his only welding work ... so far. In 1999, Rosa-Ortiz followed a romantic interest to New York City and settled in Brooklyn. Freelance architectural design work sustained him initially, as did a two-year stint as studio art director for celebrity photographer Annie Leibovitz. But Rosa-Ortiz soon found himself earning a living from art commissions. Over the next decade, he had seven solo shows and was included in more than 40 group shows in the mainland U.S., Puerto Rico and Paris, France. New York Times critics praised his work as "poetic" and "ethereal." Some exhibits placed it in the context of Latin contributions to North American culture. Yet the work that Rosa-Ortiz says launched his art career in fact referenced the epitome of American pop culture. His sculpture ingeniously re-created the infamous, revealing green dress worn by Jennifer Lopez to the 2000 Grammy Awards. "La Aparición de la Fama" was constructed of pieces of green glass found on the streets of the Bronx and the beaches of Ponce, Puerto Rico. (You'll recall that "Jenny From the Block" has Puerto Rican heritage.) These shards were given shape by the artist's devilishly complex construction method, which entails affixing each piece to a length of transparent monofilament. Hang a few hundred of these threads with the glass bits attached at just the right level, and — voilà! — J.Lo's dress hovers in space. Illuminated, the work at New York's now-defunct Exit Art gallery glowed like, well, an apparition. Surprisingly, in the context of that "L Factor" exhibit in 2003, Times critic Holland Cotter described the piece as "political." Rosa-Ortiz says his inspiration was the Virgin Mary. Whatever the interpretation, the unique sculpture marked the beginning of a years-long successful run, during which Rosa-Ortiz certainly had to call himself an artist — and commanded big-city prices for his work. "I worked with amazing people," he says simply. In 2008, though, the economy went south and, with it, most of Rosa-Ortiz's art sales. "So I thought, Now what?" he says. That's when friends told him that two enduring occupations were bartending and nursing. "Nursing is a good job with good pay and flexible hours," he remembers thinking. "I can make artwork and have a job." Rosa-Ortiz took a bartending gig to pay for his tuition at SUNY Downstate College of Nursing. "I'm amazed at how it worked out," he marvels now. Rosa-Ortiz has employed his remarkable sculpture-suspension technique in many other works, some of which are included in his current show. He admits that one of them took two days to unsnarl, putting holiday grappling with twinkle lights in perspective. He threads glass beads on monofilament in two pieces in the BCA's front room, both of them far more enigmatic than a green dress. 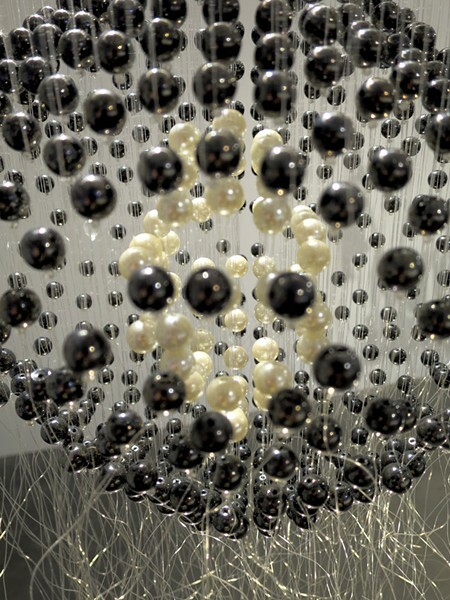 "Study on Lust," 20 inches in height and about 16 inches in diameter, is made with black hematite beads and glass "pearls" — along with a single rogue transparent bead. (Rosa-Ortiz says he always likes one to be different.) Depending on a viewer's perspective — you can walk around the piece — "Study on Lust" resembles some kind of vessel, with a bulbous base and narrow neck. Yet at the top, the neck flares out like the opening of an exotic flower. Beneath the beaded structure, the filaments dangle like Rapunzel's hair. Similar in size, "Invasive Species 1," too, is difficult to mine for narrative content. From one perspective, the shape of its red and white beads calls to mind a leaping dolphin, yet its title suggests microscopic biota. And what to make of the twin brass lockets hanging on either side? Both these unusual works are ciphers, perhaps better appreciated for their stunning technique. But a third piece hanging between them is far more literal. "Del agua mansa, libreme Dios" ("From the calm waters, save me my Lord") is clearly a raft, its platform, mast and sail constructed from bits of wood. The title and the image itself conjure thoughts of sinking ships, rescue, sailors or refugees making it to shore ... or not. Other interpretations elevate the piece from model to metaphor. Rosa-Ortiz uses found wood in works that more obviously suggest the passage of time, in the macro sense — particularly in the installation that gives the exhibit its title. 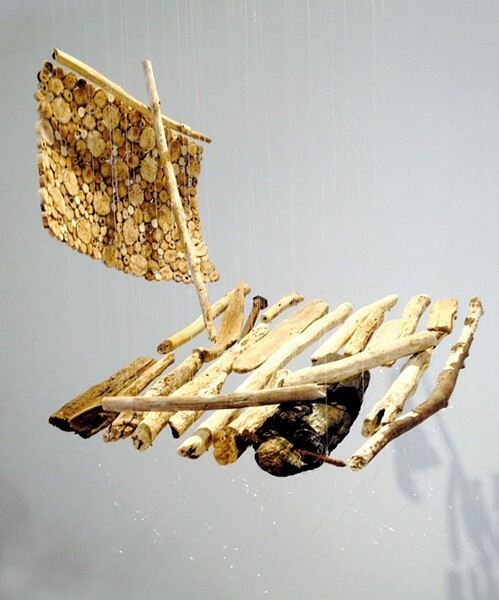 The gallery's back room is nearly filled with "An Ode to Time," a site-specific piece created with driftwood from the shores of Lake Champlain. Lengths of wood are suspended by the ubiquitous filament in concentric rings at about (adult) hip height. The elevation is intentional, Rosa-Ortiz says; he wanted viewers to be able to look down at the piece and across it. Children and more adventurous grownups have scooted underneath it, even lying on the floor, to look up through the rings, Hellerman reports. At the center of the piece, the successively smaller rings funnel downward, adding dimension. More than anything, "An Ode to Time" resembles a constellation and, as such, a measurement across eons rather than a human lifetime. This mind-expanding portentousness is leavened by the fact that the entire installation has a bit of a wiggle — the individual pieces of wood respond to slight breezes and the movements of viewers in the room. It's as if the universe were trying to be friendly. "Piety," however, lends the installation gravitas — and mystery. 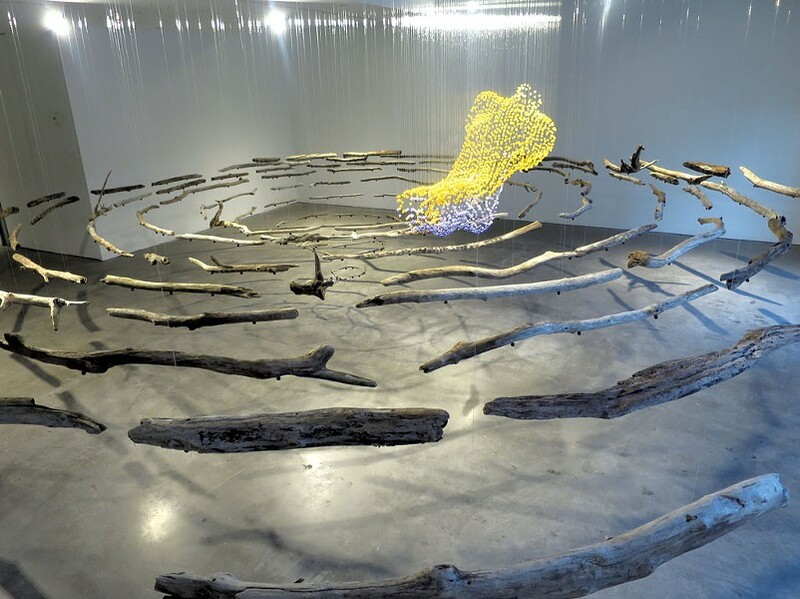 Created using Rosa-Ortiz's suspended-filament technique, the torso-shaped work, composed of yellow and purple beads, seems to float above the wood rings. Though from one angle it incongruously resembles a woman's high-heeled shoe, the piece actually echoes the position of Christ's body in Michelangelo's marble sculpture "The Pietà." Once you know that, you can't unsee it. Though Rosa-Ortiz claims not to be particularly religious, his pairing of a reference to this revered 15th-century work with a humble driftwood construction gives viewers a lot to think about. Locals are advised to take a stroll down to City Hall Park in the evening and gaze at "Piety," illuminated and glowing, through the BCA Center's rear window. If glass beads don't evoke a particular place or time, driftwood certainly does. The installation "An Ode to Time" evokes Lake Champlain, at least to viewers who live on Vermont's west coast. To Rosa-Ortiz it more generally represents his new home. So does the piece that brought him to Vermont in the first place. Also titled "An Ode to Time," the 43-by-29.5-inch framed construction is on loan from the friends who commissioned it. Here the concentric rings consist of twigs cut into pieces no more than a couple of inches long and meticulously pinned to a foam-core backing. The wood, notes Rosa-Ortiz, came from the couple's Warren property. "The Tree of Knowledge of Good and Evil"
"I like working with materials that have a history, a story," the artist says. Then he adds: "But if people come to the show and just think it's beautiful, that's fine with me." Concentric rings appear again in a pair of mixed-media works, both titled "Tree Rings Light Box." In one, Rosa-Ortiz has glued tiny particles of black magnum to white Mylar in successively larger circles; in the other, he used mica. Both are backlit. From the viewer's perspective, these seem like distant collections of stars that will forever remain unknown. These don't hold a candle, so to speak, to the sparkle Rosa-Ortiz employs in his works with Swarovski crystals. 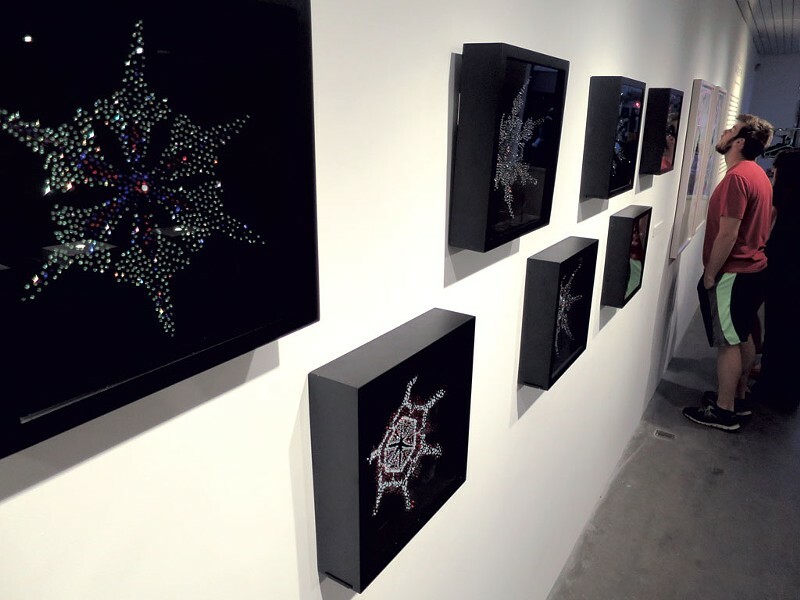 These pieces have unlikely subjects: In one series, seven deep black frames hold Rosa-Ortiz's variations on Wilson "Snowflake" Bentley's photographed flakes. The Vermonter (1865-1931) famously shot individual snowflakes and verified that no two were the same. Rosa-Ortiz plays with this concept but renders his six-sided beauties in sparkly colored crystals adhered to the ends of three-inch brass pins. As a result, the designs appear to float above their black silk-velvet backgrounds, like more elegant versions of Mexican sequin appliqués. These works are new, and Rosa-Ortiz says he will likely create more. Like Bentley, he is fascinated with the endless variety — and it's a way for the artist to make a bit of Vermont history his own. Rosa-Ortiz also puts the crystals to work in more somber works. Though you have to look long and hard to see it, a Buddhist monk's self-immolation is the subject of "Hephaestus." 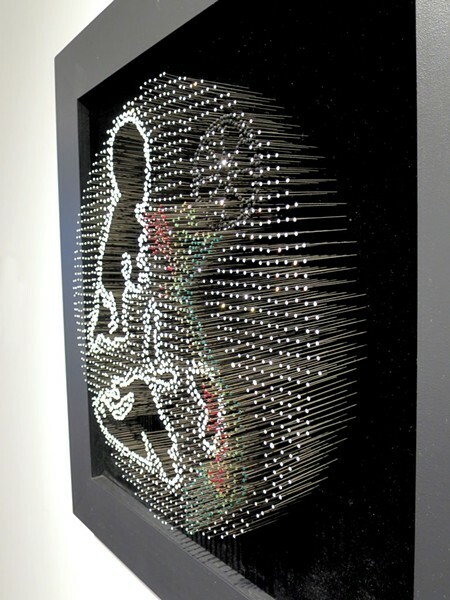 His seated shape appears as a negative-space silhouette, its outline made of white crystals on those long pins. Next to it, colored crystals, also on pins, form a map of Vietnam. A second work in this vein, "Poseidon" combines the silhouette of an Ottoman ship with a Star of David, a reference to the ancient persecution of Jews. If these subjects seem arcane, they speak to the historical research behind some of Rosa-Ortiz's work. "Sometimes I pick a topic because I want to learn from it," he explains. And why use sparkling Swarovski crystals to tell these stories? "Because they're gorgeous," the artist answers with an impish grin. A pair of two-dimensional works in "An Ode to Time" references a traumatic story: 9/11. Rosa-Ortiz was living in Brooklyn the day terrorists struck the twin towers of the World Trade Center. The resulting destruction was absolute — and yet ordinary bits of paper wafted from that wreckage across the East River. A couple of days later, Rosa-Ortiz followed his artist's instinct and gathered up as many pieces as he could find. Many of them were singed by fire. "It was years before I could do anything with them," he notes. 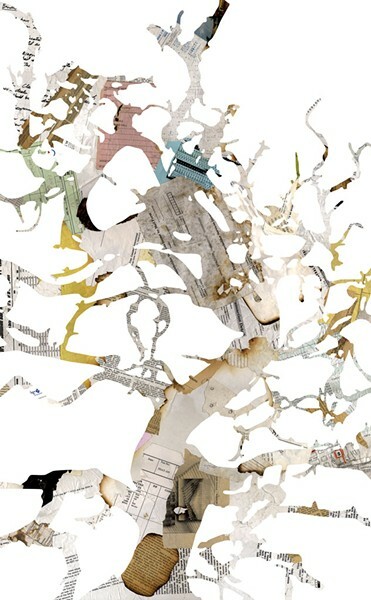 "The Tree of Knowledge of Good and Evil" and "The Tree of Life" were initially made as light-box installations, using the paper debris in solemn, commemorative collages. At the BCA Center, the works are prints made from the originals, with white crystal flocking forming a glittery tree pattern over each. Business cards, letterhead, computer printouts, directories of names, a racetrack ticket, Chinese newsprint — all these mundane fragments speak to lives lived, and lost. In this pair of prints, random chaos begets elegiac beauty. 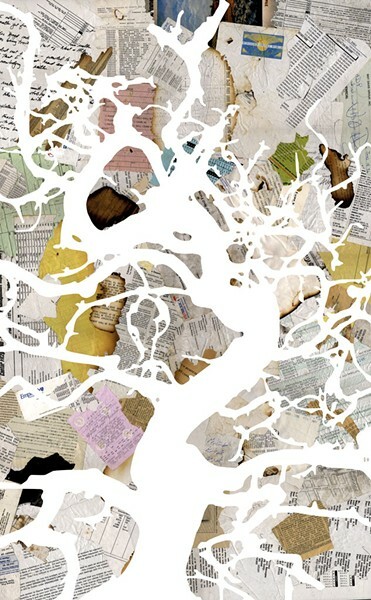 Rosa-Ortiz's exhibit "An Ode to Time" speaks to the inevitable condition of evanescence. Ironically — or perhaps fittingly — his nursing job, too, deals with human passages between life and death. He loves that the career affords him time to make artwork, but there is more. "At the end of the day," says Rosa-Ortiz, "I feel good about it. I helped someone walk today. I eased someone's pain. "Ultimately, I want to do hospice work," he continues. "I'm drawn to people who are in their last stage of life. When they come to their crossing, I think I would be a good person to help." The original print version of this article was headlined "In Good Time"